Reposaari - Sail in Finland! Most Finnish cities on the sea shores or on the lakes have sprung up around a harbor. As cities grow, these inner-city harbors become coveted building plots and the harbors with their authentic and often rough neighborhoods disappear. The city of Pori is an exception. Pori sits on the estuary of the river Kokemäki, quite far from the open sea. The city itself does not have a proper harbor which instead is located on the island of Reposaari, some 15 NM from the city center. 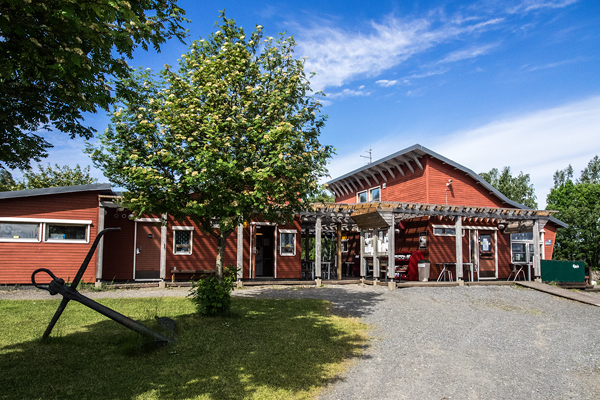 As a result Reposaari has been spared from a demolition and building frenzy and still offers a traditional small-town community feeling for visitors and inhabitants alike. 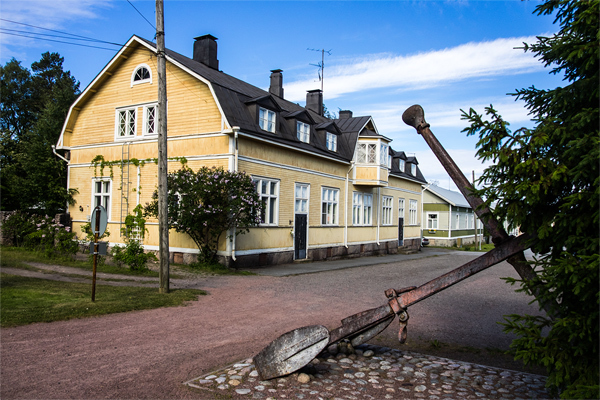 The center of Reposaari is a lovely neighborhood with mostly old wooden houses. The history of Reposaari actually precedes the city of Pori. 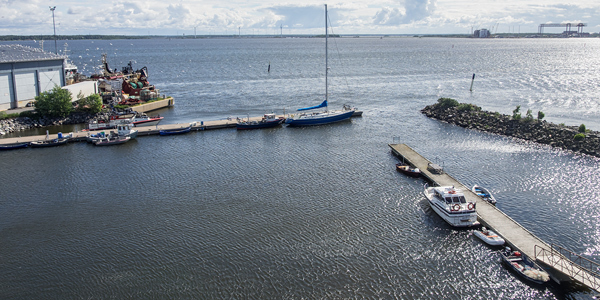 Reposaari’s sheltered harbor had been a well-known anchorage long before Pori got its city rights in 1558 at which time Reposaari became part of the newly formed city. By the 17th century, Reposaari was one of the major trade harbors in Finland. It says something of the importance of Reposaari in the 18th century that professor Israel Nesselius from the University in Åbo (Turku in Finnish) proposed that Reposaari should become the capital of Finland (then part of Sweden) instead of Åbo. 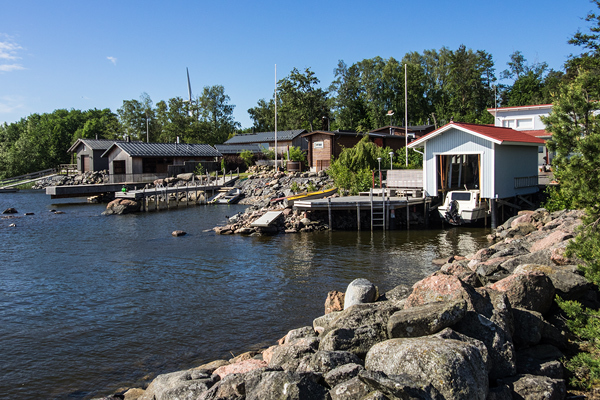 A small fishing harbor reminds us of Reposaari’s past as a busy commercial harbor. Nearby Mäntyluoto in the background is the new commercial harbor serving Pori. The height of Reposaari’s (maritime) greatness occured during the 19th century. In the early 19th century shipping was the main business. Industrialization, in particular in England, opened up new markets, especially for timber products. In the latter half of the century, the Kokemäki river was used for timber rafting and a saw mill was built in Reposaari in 1873. The timber floated to Reposaari and the products from the saw mill could then be easily loaded on board ships for export in the harbor which for a short period became the biggest export harbor in Finland. Reposaari was also the home to a number of successive boatyards. The most important were the Reposaari machine works which kept up the tradition until the last one yard closed down in 1975. Modern holiday houses can now be found were once the industrial center of Reposaari was located. After the closure of the last industry, Reposaari has turned into a sleepy neighborhood that still retains a little of the rough harbor feeling from days gone by. It is one of the best preserved wooden cities and still preserves a atmosphere of working class chic, typical for the early half of the 20th century. Since 1956 the island has been connected to the mainland with a bridge but it lasted until 2008 before Reposaari got a new chance for some renewal when the island was the host of the Holiday Housing Fair in Finland. This resulted in some new developments along the shores of Reposaari. 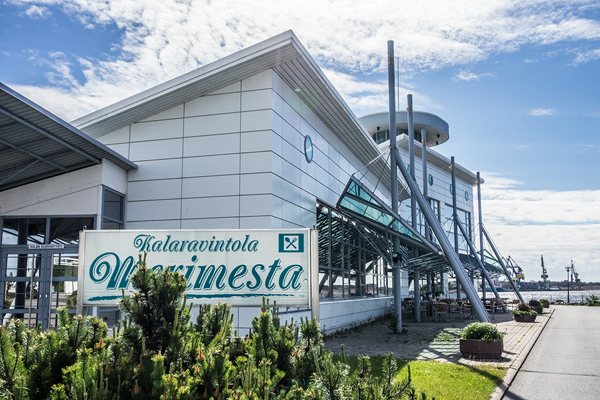 For boaters Reposaari offfers one of the best marinas along the Sea of Bothnia coast, the Merilokki Marina. The island and the marina are easily accessible and offer a very sheltered harbor for 60 boats. This means that you never need to worry about not finding a berth. The services offered are good. The marina has a nice service building and also sells diesel and gas. There are a number of shops in Reposaari so you do not go into Pori if you don’t want to. Reposaari is still a fishing harbor and one of the few places left in the archipelago where you actually can buy fresh fish right in the harbor. 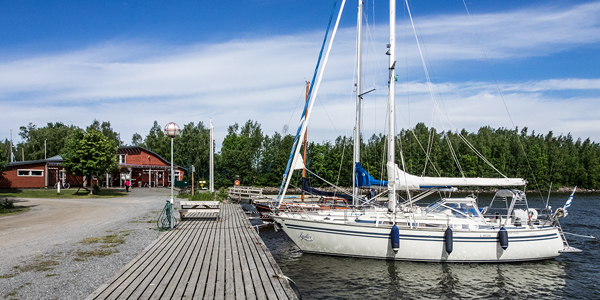 The Reposaari marina service building has all the services a boater needs. If your ship’s cook has had enough, there are also a couple of interesting restaurants in Reposaari. If you are game for fish, then the modern fish restaurant Merimesta is perhaps just what the doctor ordered. For a little more traditional dining you might try the restaurant Reposaari which claims to be the second oldest restaurant in Finland. The Kalamesta restaurant on the SE tip of the island also has a small observation platform with a great view of the surroundings including the Mäntyluoto harbor in the distance. If you want to stray a bit from Reposaari, your first stop should be Yyteri, the nr. 1 beach in Finland. Yyteri is a comfortable cycle tour from Reposaari and a must if you are into surfing or wake boarding or just soaking in the sun. If you want to do a bit more advanced shopping or see some interesting sights, the city of Pori is just a short bus ride away. Pori has the charm of a wealthy old industrial city. One of the must-see sight is perhaps the Rosenlew museum showing the history of one of the most famous metal industry companies in Finland. 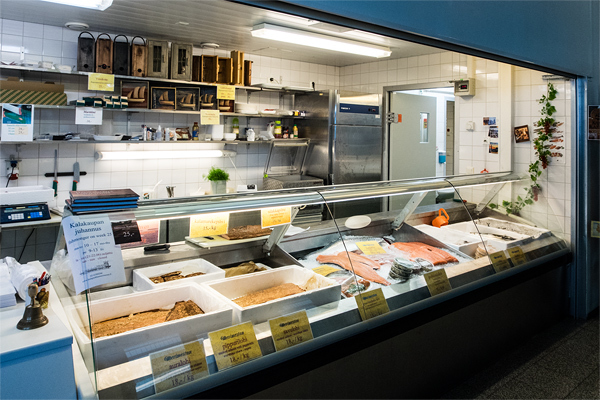 The fish shop is housed in the same building as the Merimesta restaurant. On the cultural side, Pori is perhaps best know for the Pori Jazz festival, the biggest popular music event for middle-aged people. Since a few years back, Pori is also the host to the SuomiArena, a summer get-together for politicians, influencers and media (both the real and the wanna-be kind) in open discussion fora modeled after the Almedalen event in Visby, Gotland. If you are anyone in Finland, you need to go to either or both of these events. The last outpost before the open sea. 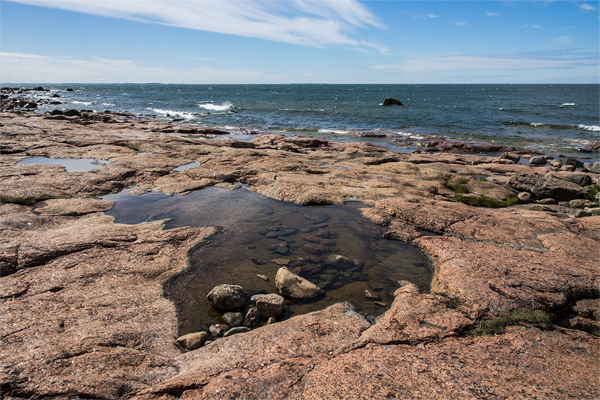 For more information on the wider surroundings, check these posts on the Sea of Bothian and the Bothnian Sea National Park.